Yesterday I shared my New Years resolution. And I asked you to join me. I also shared that our new ebook is being released today and I am super excited to hear what you think. A few weeks ago, I asked for a few of you to give me your first thoughts. Within a few minutes, I received several offers. And the response has been amazing. Almost everyone of the ladies asked for permission to pass the ebook along to a friend or women’s ministry leader. If you have already subscribed to our blog, you will see a link at the bottom of this post. By clicking on this link, you will be directed to a page where you can read the book online, print, or save the file to view on your favorite ebook reader. If you haven’t subscribed, please do! After subscribing, you will begin receiving weekly posts on your feed reader or in your email inbox. The link will be at the bottom of each post. 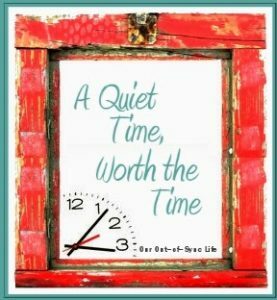 What is “A Quiet Time, Worth the Time”? Do you ever feel like there has to be more to life than simply surviving each day? As the mom of four kiddos, I begged for there to be more than the exhaustion that I was feeling. It was in that pit that I realized that God was my answer and hope. And I realized that sitting at His feet each morning for a quiet time was the only way that I was going to make it through each day with purpose. But where should I begin? What is the purpose of quiet times? What is God is calling me to be? When and where should I have quiet time? What do I do during this time? How can I be an image bearer of God? How do I make this time worth getting up for? What is journaling and how will it enhance my quiet time? What items are necessary in order to have a quiet time? Why is it important to dig into and memorize the Scriptures? How can I overcome obstacles that keep me from having a quality quiet time? After reading A Quiet Time Worth the Time, I incorporated some of those guidelines and even thought “Boy, how will I be able to wake up early every morning and have time to myself and even try and do it on weekends too!” But now I’m excited for those mornings!! I can hardly wait to wake up and spend my first moments with Him. How can I read A Quiet Time, Worth the Time? If you are reading this blog post in your email or in a RSS feed, scroll down and you will see the link for the workbook at the bottom of your email or RSS feed. Follow the directions after clicking on the link. If you are reading this blog online or through Facebook and have not subscribed, the FREE link is available to blog subscribers. But don’t wait because the link to the PDF file is only shared once a week on Tuesdays. Click to sign up for weekly emails or RSS feed and you will receive the link next week! Also, please take a moment to contact me with the thoughts, questions, and suggestions that you have concerning our new ebook. I look forward to hearing from many of you! Previous Post: « What Will Your Resolution Be?